Mission HSM is off to Big Bear where we have rented a GIANT cabin on the Lake Shore. 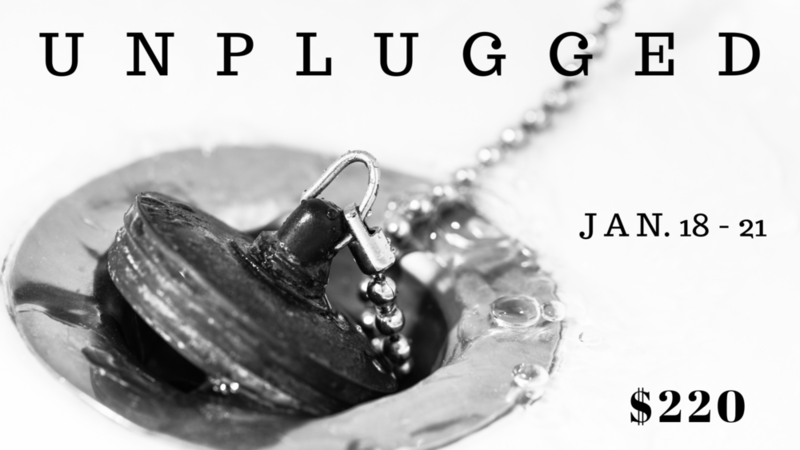 This year, we will be diving into the theme, "UNPLUGGED." As believers we often take our experiences and stories we've heard over the years and we hold onto them and we draw from them time and time again; and although experiences and knowledge are good, Jesus wants us to be using our experience and knowledge to grow others, teach others and encourage others all while we are continuously being filled. If we allow our tanks to fill to full, we leave ourselves in a place where we can no longer receive, so we must unplug, so we can receive something new that Christ is eager to give. We hope you will join us on this amazing weekend (MLK) up in our beautiful local mountains for 3 full days of fellowship, worship, the Word...and YES...we will have a lot of fun too! We often romanticize the Christmas season, thinking that our lives and families should be perfect this time of year. When our realities don't live up to this idyllic expectation, we can experience intense pain and loneliness. But even at the very first Christmas, the people involved were fighting feelings of hurt and disappointment. And yet, God used these people and events to bring about His plan of salvation. Join us as we explore how this Christmas we are presented with the option of relying on the comfortable and familiar or stepping out in faith and embracing God's plan. The Eagle and Child is a rock/worship band from San Diego, that has spent the recent years crafting a dynamic, and reverent Christmas Concert. Passionate about reflecting God's creativity through music and art, The Eagle And Child have crafted compelling, joyous, reflective arrangements of our favorite Christmas Songs. This event, using music and art, drums... a lot of drums... will focus on the most significant arrival since time began, the incarnation of The Son of God. Invite your friends, family, believers, and non-believers to celebrate this season together. Your invited to join Pastor Mike as he shares the story, mission and vision of MVCC. We would love to get to know you and answer any questions you may have about MVCC. A light breakfast will be served and kids can be checked into Mission Kids at any time after 8:45 AM. Junior Highers, join us as we BLITZ through the night at MVCC for dinner, head to BOOMERS for crazy attractions, and then jump the night away at CIRCUS TRIX! The cost is $50 per person (pay upon arrival) and that covers food, attractions, and even jumper socks at Circus Trix. Be here to check in and eat at 4:45 and we'll BLITZ all NIGHT long. When you sign up: Attached is a waiver for CircusTrix - Please fill it out and bring to check in! We will be heading out to a HUGE house in Palm Springs with a dope backyard and just spend time together soaking up the sun and making great memories. We will be working through a study called, "ANCHORED." Where we will be discussing as young adults what it looks like for us to be Anchored in our faith, in our jobs, in our relationships. Spots are limited, so sign up quickly! We will be heading to our annual Summer Camp at Hume Lake. "For God so loved the world that he gave his only Son, that whoever believes in Him should not perish but have eternal life." But has our familiarity of this verse caused us to lose sight of its significance? Do we fully understand God's love and purpose for humanity from the very beginning of time? This summer we will focus on God's redemptive plan throughout the grand narrative of scripture as he rescues his people from the curse of sin and will one day come and restore all things back to Himself. Our hope is that as we seek to know God more, our love for Him will grow which results in a life fully surrendered to him. HUME SD is a week long Summer Camp designed to impact the life of your Jr. High Student for all eternity. This week of Camp is crafted specifically for Jr. High Students and is literally the best week out of the entire year. This week is filed with all you can eat food, tons of competitions, daily free-time, engaging worship sets, and life changing messages that your child will be sure to remember for the rest of their lives. We can't wait to see you at HUME SD and see how God changes lives. You will spend time discovering your gifts and talents. Our hope is that you will enter into mission by discovering how God has shaped you and acting on what He is calling you to do. Life is better when done together in community. Our hope is that you will experience community by making new friends and join a life group. But has our familiarity of this verse caused us to lose sight of its significance? Do we fully understand God's love and purpose for humanity from the very beginning of time? This summer we will focus on God's redemptive plan throughout the grand narrative of scripture as he rescues his people from the curse of sin and will one day come and restore all things back to Himself. Pastor Mike will share some of his personal story and the story of MVCC. Our hope is that you will expand your understanding of what it means to pursue a relationship with God in community at MVCC.